Toyota will finally reveal its long-awaited Yaris hot hatch at Geneva in a couple of months. When Toyota showed us a video of its 380 horsepower rally-spec Yaris having a whale of a time catching air and sliding in the snow ahead of its debut in this year’s WRC for the first time in 17 years, it promised that a production-spec model would soon follow. Indeed, we’ve been waiting for a hot version of the humble Yaris hatchback to emerge for some time now. The wait is nearly over however, as Toyota has finally given us a first look of its long-awaited Yaris hot hatch, confirming that it will debut at the 2017 Geneva Motor Show in March. While the new Yaris is based on its rally counterpart, expecting the road-going hot hatch to match the performance of its savage sibling would be unreasonable. As such, Toyota says that the new three-door performance Yaris will bridge the gap between the rally car and the Yaris model-line-up, packing in a powerful engine producing over 210 horsepower. That puts it firmly in-line with the fast and furious Ford Fiesta ST. New front and rear splitters, a rear tailgate spoiler and distinctive alloy wheels help differentiate the new performance-focused Yaris. The bodywork also benefits from graphics inspired by the WRC car’s rally livery. 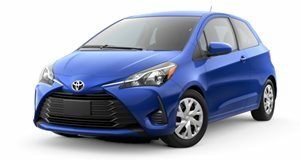 The entire Yaris range is also getting a refresh with a slew of cosmetic changes based on the hot hatch, including a new, more imposing front face, a new rear style and a modernized interior, plus technical modifications to improve comfort and handling. The hot hatch will be displayed at the Geneva Motor Show alongside the WRC-spec Yaris rally car, which will be debuting at the Monte Carlo Rally next week on January 19.